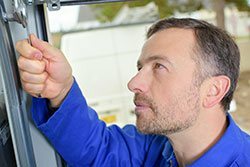 The Exclusive Garage Door Service technicians are highly experienced in all aspects of garage door servicing, including repair, installation, design, and maintenance. 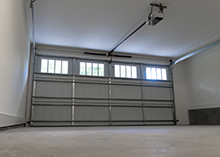 We recommend that all customers establish a routine maintenance schedule for their garage door. This proactive approach helps to prevent major system failures that could render the entire door inoperable. You can contact us 24 hours a day, seven days a week if you notice the need for maintenance and you don’t already have a schedule established. Home and business owners who are looking to save money and who don’t understand the complexities of garage door systems often make the mistake of hiring an under-qualified technician. Unfortunately, this usually makes the problem worse instead of better. What should have been a minor repair can turn into the need to replace the entire door. It also increases the risk of injury, both for the inexperienced technician and anyone who uses the garage each day. At Exclusive Garage Door Service, we would never send an unqualified person to a repair job because we only employ the best. Our technicians have extensive experience to draw from in addition to their educational credentials. When you call us for help, our mobile service unit will arrive at your location in Fort Worth within the hour to safely assess and correct the problem. While saving money is always nice, it’s not worth the small amount you could save by hiring a garage door service company without our level of trust, experience, and commitment to satisfaction. Due to the intricate way garage doors are designed, the failure of one small part has a dramatic impact on all of the others. This is one reason why regular preventive maintenance is so important. These routine check-ups are especially important for heavy-duty overhead doors and specialty doors. 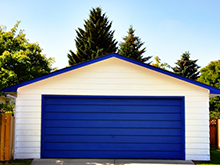 Regardless of the type of garage door you have, our service technicians have all of the necessary tools to complete a thorough inspection and tune-up. At your routine maintenance appointment, our service technicians attend to any current issue as well as point out ones that could present a problem in the future. We devise a maintenance strategy on the spot to keep all parts in excellent working order. Your technicians from Exclusive Garage Door Service inspect all components of your garage door at this appointment, including the hardware, springs, panels, pulleys, and much more. 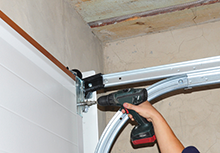 Your garage door’s track assembly includes wheels attached to the sides of each door and a long column that they slide on when the door is in motion. You may be unable to open or close the door at all when one of the wheels leaves the track for any reason. Unfortunately, trying to get the wheel back in place usually makes the problem worse. One of the leading reasons for garage door tracking problems is a broken cable. These often fall victim to excess moisture, corrosion, and extremely hot or cold temperatures. The slow deterioration through the years suddenly cumulates in a cable snapping and causing the wheels attached to the garage door to lose their place on the track. It is rare for the cables on both sides to break at the same time, but your garage door may still be inoperable with only one side broken. 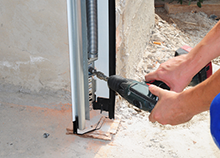 Another common reason for off-track problems is a malfunction of a garage door’s electric eye. This is the component that stops the door from going up or down if a solid object is in its path. When the electric eye gives out, it is unable to detect anything and objects on the tracks may push the wheels out of alignment. The impact of something striking the garage door can cause this problem as well. No matter what happened to cause an off-track issue, you don’t have to wait for help from Exclusive Garage Door Service. Someone is available to take your call 24 hours a day.